Over the past few days, we have enjoyed productive meetings with members of Congress and staff talking about the fixes for contract working dogs and military working dogs. These issues are complicated as anything is in the government and defense bureaucracy, but we are working collaboratively with Congress and are so appreciative of the members’ insights and willingness to roll up their sleeves and help. Military and contract working dogs save lives on the battlefield and on the home front. We all agree that we must honor their service and ensure that they return home and make every effort to reunite them with their military handlers. It is estimated that each military working dog/contract working dog saves the lives of between 150-200 service members. That means more sons and daughters are returning home from service in dangerous combat zones because a highly trained dog found weapon caches, enemy positions and serious threats. The enemy knows the value of these dogs – the Taliban is known to shoot the dog first and the handler next, as that takes out a line of defense. Airfields can’t be cleared when there is no canine team on the ground. Corporal Jeff DeYoung remembers being identified by villagers in Afghanistan as “the dog man” – and he knew he was a target. Most military working dogs do find their way back to American soil, especially because of the stellar efforts of the United States Air Force. Military working dogs serve many functions in defense, and are highly valued in the military. The Military police (MP) program utilizes military working dogs, and servicemen are paired with a canine from a young age all the way through their military contract. However, contract working dogs provided through defense contractors are not owned by the military, and are issued to infantrymen or engineers for the duration of their deployment with several weeks of training. When the deployment is over, the dog is returned to the contractor for a period of acclimation and retraining. The contract working dog is then returned with a new handler to combat theater. It is these dogs that served on deployments with the 101st Airborne for TEDD and the Marines for the IED programs for example. They have seen real combat in Iraq and Afghanistan, and have forged indelible bonds with their handlers. While the National Defense Authorization Act for FY 2013 authorizes the transfer of a retiring military working dog if no suitable adopter is available at the military facility where the dog is located, the language refers to “may transfer” rather than “shall transfer” – and no provisions are made whatsoever for contract working dogs in the Act. The fact is that if a military working dog or contract working dog is retired in a non-combat zone overseas, that dog becomes a civilian and cannot travel on military transport. The fact is that suitable adoption is also not defined. The fact is that the Act only refers to military working dogs, with no reference to contract working dogs who serve in combat zones alongside the Marines and Army Infantry. And frankly, I have increasing concerns about allowing adoptions overseas unless there is a former handler involved. These dogs, whether they are military or contract working dogs, are highly trained and specialized for combat duty. With the growing radicalized elements and threats facing our forces and our country, scenarios could be played out that terrorists, posing as local families overseas, could adopt these dogs upon their retirement and turn around and use them against our own forces. That’s why we need better regulations around overseas adoptions. And, we need better regulations of K-9 contractors to ensure these highly trained canine forces are never available through “firesales” on Craigslist when kennels lose their defense contracts, or dogs become eligible for retirement. Military working dogs (owned by the military) should be brought home to U.S. soil before being retired. We believe this should be the case for all our military dogs: contract working dogs and military working dogs. Additionally, their former handlers, who have the strongest bond with these animals, should be given the first chance to adopt. There is a reference to military working dogs in the National Defense Authorization Act, and we are recommending a modification in the existing language as outlined below. Contract working dogs (owned by defense contractors) should be brought home for their retirements. While many private contract companies that supply trained animals to the armed forces are working to bring these dogs home, there are no government regulations regarding the welfare and retirement outcomes for these war dogs. Private companies have custody of the animals and are in control of their future. The Soldiers and Marines who served with their contract working dog have no input. Given the special circumstances of these dogs, there should be requirements in the government contracts for such private companies to ensure their well-being and retirements provided in the homes of the Soldiers and Marines who served alongside them in battle zones, their battle buddies. There is no reference to contract working dogs in the existing National Defense Authorization Act, and such language would need to be inserted as suggested below. Veterinary care regulations state that a system may be established for the medical care of retired working dogs, but such regulations prohibit federal funding. American Humane Association instead called on the private sector to embrace the health and well-being of these retired hero dogs by funding a veterinary care program with American Humane Association. American Humane Association again calls on the private sector for a privately funded primary veterinary care system for these war dogs (specialty veterinary care was secured through a generous gift by Red Bank Hospital System after our last Capitol Hill visit). There is no legislative impact, but our ongoing call to action continues to the private sector for primary veterinary care. Military and contract working dogs shall be retired in the United States, unless their former handler is overseas and wishes to adopt. This language should be clarified in the National Defense Authorization Act. All military and contract working dogs shall be retired in the United States. Ref. NDAA Sec 371, the insertion of subsection (f) addresses the issue that “the Secretary may transfer the dog.” The intent here is to do away with the “may” language and replace with “shall” transfer the dogs to the U.S. or the adopting handler’s location, should he/she decide to remain near their base in a foreign country. Dogs who are not adopted by their handler or deemed fit for adoption should returned to the U.S. so they are not left overseas, as former handlers and veterans may be ideal to provide forever loving homes. Obviously, the language can be written such that, if a handler is stationed at a foreign base and decides to remain near that base, the dog does not have to be returned to the U.S. and the adoption may occur at the foreign base. 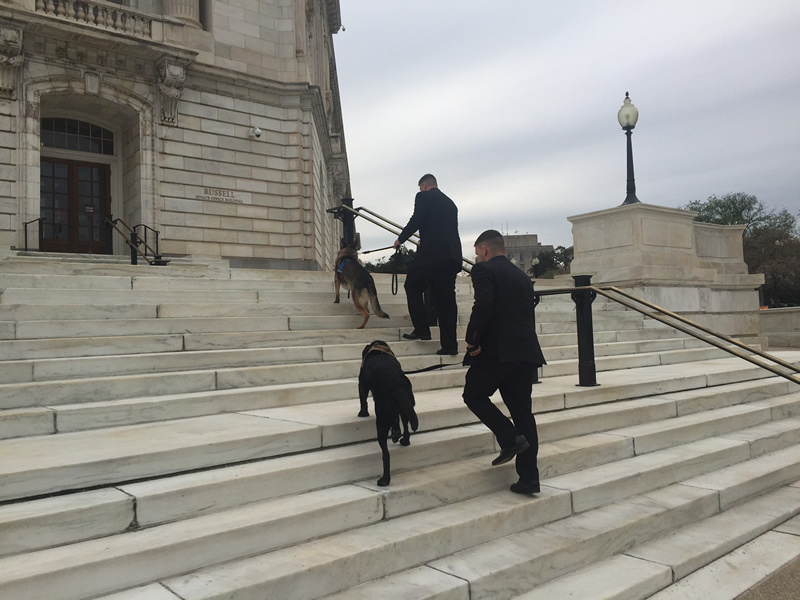 Legislation should provide for better oversight and standards of operation for the K-9 contractors impacting the lives of the contract working dogs. In cases of the general sale or adoption of MWDs or CWDs by the military or contractors, veterans and their families should be given priority. This language can be included in the National Defense Authorization Act, or offered through contractual requirements. While we know that these issues need to be worked through from a legislative perspective, we also know that these combat dogs, regardless of how they are classified, as military or contract working dogs, save the lives of our servicemen and servicewomen – and as with their human counterparts, they often suffer from the invisible wounds of war, PTS. These canine battle buddies are in need of a safe, forever loving home for their retirement, and there is no better home than that of their former handler or the larger veteran community. It’s about healing on both ends of the leash – and the power of the human-animal bond.